Painted Narratives: the Other History, Mexican Votive Offerings: An Exhibition. Gallery X on October 3 at 4:00pm. This is a very special collection of pictorial votive offerings dating from the 17th-century to the present day, including a small-format piece that is the oldest one on record. These offerings provide a popular record of the Independence wars and the Mexican Revolution. 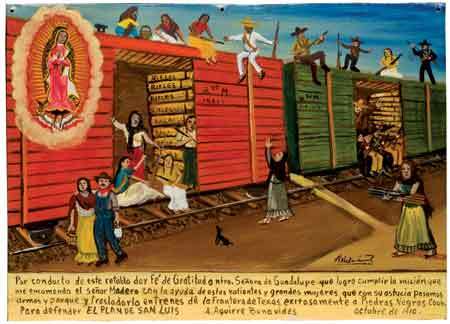 Titled "Los relatos pintados: la otra historia, exvotos mexicanos", this exhibition is the product of 20 years of academic research. It is worth noting that 60 percent of the works on display have never been exhibited before. The show is especially noteworthy due to the artistic and historic value of the votive painting genre. The votive painting genre has been less recognized, since we’re usually more engaged with history understood as a series of great episodes. This collection, however, gives us an insight into three centuries through the personal, direct and spontaneous perspective of common people. The purpose of this selection is to show an overview of 200 years of Mexican history. The pieces describe people’s thoughts, concerns and intimate feelings, as well as their participation in battles, the places they frequented, and common practices and events from their everyday lives. Curator Elín Luque explained that exvotos are objects that express a person’s gratitude. They date back to antiquity, but painted offerings were introduced in Italy during the Renaissance. The tradition came to Mexico with the missionaries that brought with them the veneration of the Virgin Mary. They portray scenes from “miracles” and were used to show gratefulness to an interceding saint. The exhibition is divided into thematic areas. First, there is an introductory section with a wealth of 16th-century offerings that remain in the country. In other sections, the show makes reference to the Independence and Revolutionary movements, and to the foreign interventions that impacted the country in the 19th-century. Among the exvotos that deserve special mention, is one dating from 1828. There are also several offerings painted by Alfredo Vilchis, one of them dealing with the proclamation of Emiliano Zapata’s Plan de Ayala, and others portraying unknown soldiers that took part in the defense of the country during several military conflicts, such as the Mexican-American War (1846-48) and the French Intervention in Mexico (1862-67). In the section devoted to Modern and Contemporary Mexico, there are subjects ranging from the Cristero War (1926-29) to current concerns such as emigration to the US. According to Luque Agraz– the exvoto tradition is still very much alive. It is practiced in very venerable holy places, like the Santo Niño de Atocha in Fresnillo, Zacatecas; the churches of San Juan de los Lagos and Talpa de Allende in the state of Jalisco, and the Tepeyac Basilica in Mexico City. Presented by the Department of Classical and Modern Languages and the Department of Fine Arts.